1. 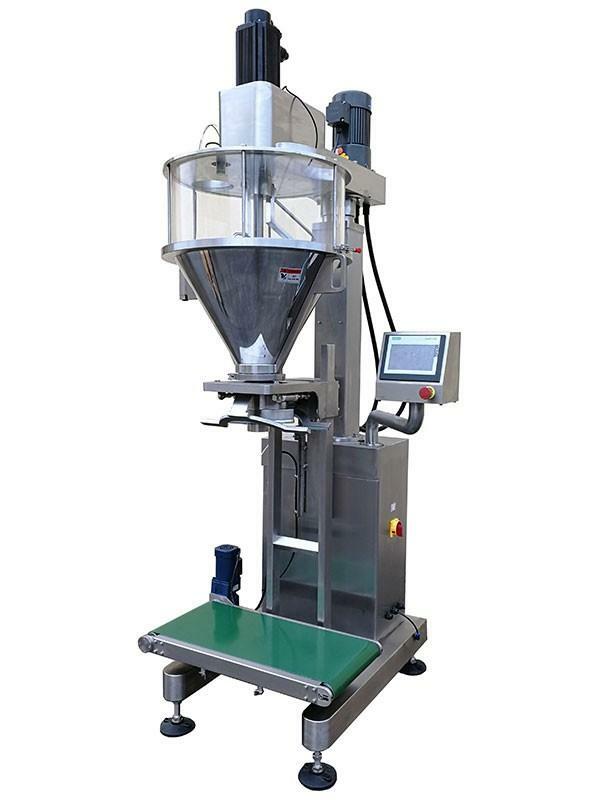 Pneumatic bag clamping device and bracket mounted on the weight sensor, the fast or slow filling according to the preset weight. 2. The high reaction speed weighing system guarantees high accuracy. 3. The servo motor drives the tray up and down, the lifting speed can be set discretionarily, and no dust goes out when filling to contaminate the environment. 4. Servo motor and servo drive control the screw, stable performance and high precision. 5. PLC controls the system, touch screen human-machine interface display the content, easy to operate. 6. Working process: manual bag loading or manual can loading - container lifting - rapid filling, container dropping - weight reaches preset value - slow filling - weight reaches target value - remove container manually. 7. Pneumatic bag clamper and bottle holder are optional, choosing a different device can reach different requirement. 8. Two kinds of working methods can be switched, quantitative and real-time weighing, quantitative weighing is faster but lower accuracy, real-time weighing has higher accuracy, but slow. Application︰ This machine is designed for high-precision packaging and ultrafine powders easy to raise dust, according to the signal given by the weight sensor, it can complete the two-speed filling, measuring, lifting and other functions, it is applicable for packaging food additives, feed additives, non-dairy creamer, lithium battery materials: ternary, lithium manganate, lithium cobalt oxide, lithium iron phosphate, carbon powder, dry powder extinguisher, other ultra-fine powders, and high-precision packaging requirements powder and so on.